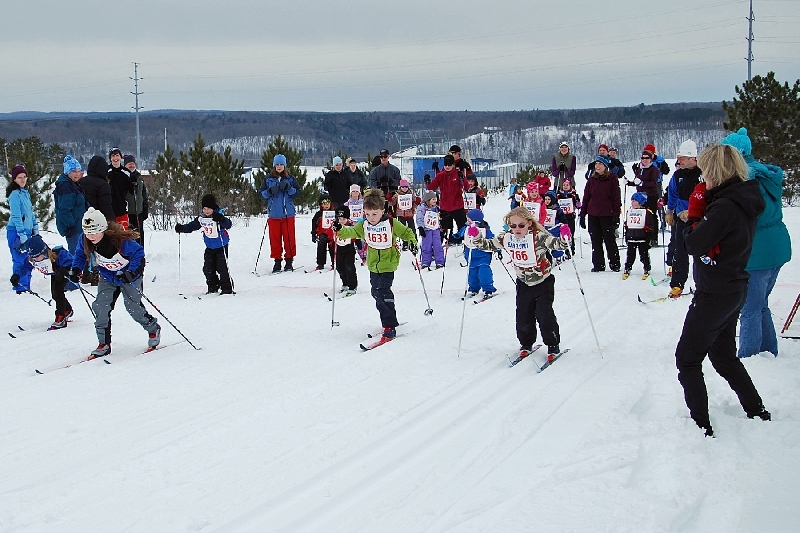 The 4th Annual Sons of Norway sponsored children's ski races, in association with the Keweenaw Nordic Ski Club, Portage Health, and the City of Hancock, was held the second Sunday in February at the Maasto Hiihto Ski Trails in Hancock. 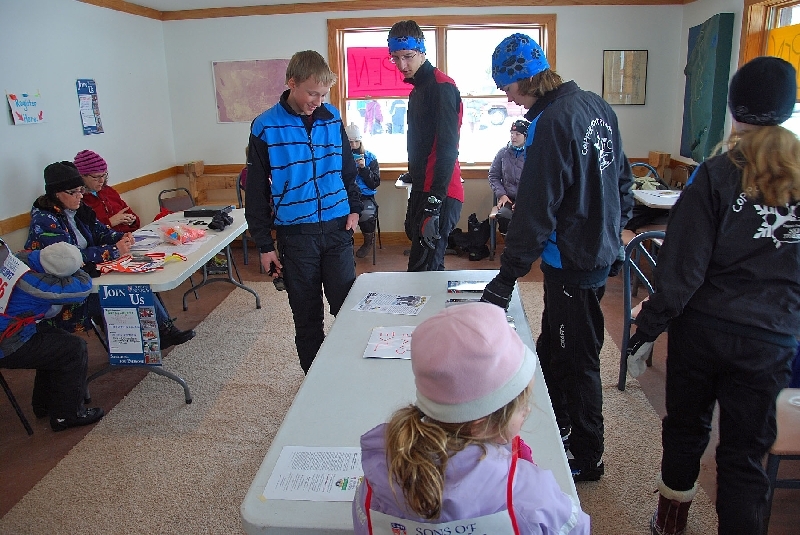 Workers and race fore runners look over the various course routes prior to the beginning in the Hancock Ski Chalet at the Hancock Fairgrounds. The 6 km (2.7 miles) race gets under way. 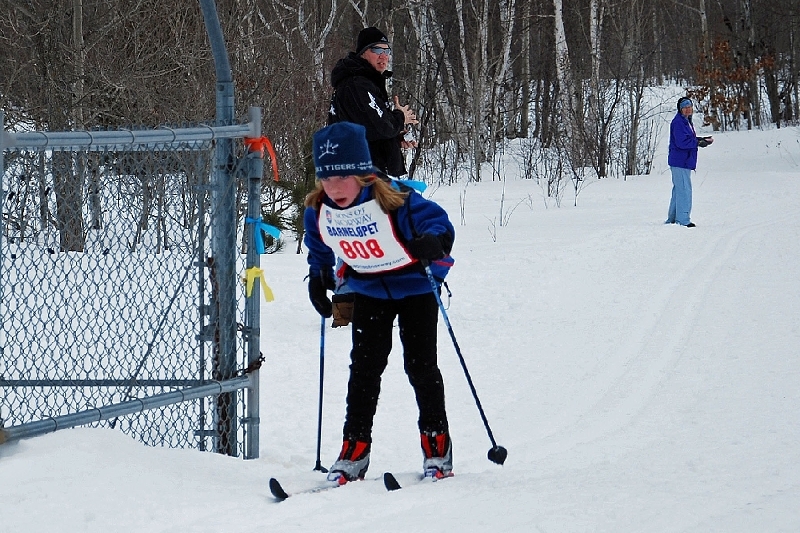 There were 4 races offered, a 6 km, 4 km, 2 km, and a 1 km. Children were not registered by age, but by the race distance they were interested in trying to compete in. 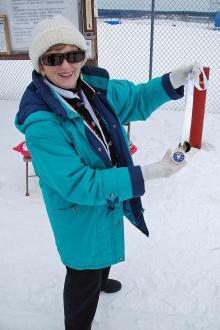 As this was a non-competitive race venue, no times were recorded, and all race finishers were awarded a medal. The 4 km (1.8 miles) race is underway. Barnelopet is a Norwegian term for a children's race. 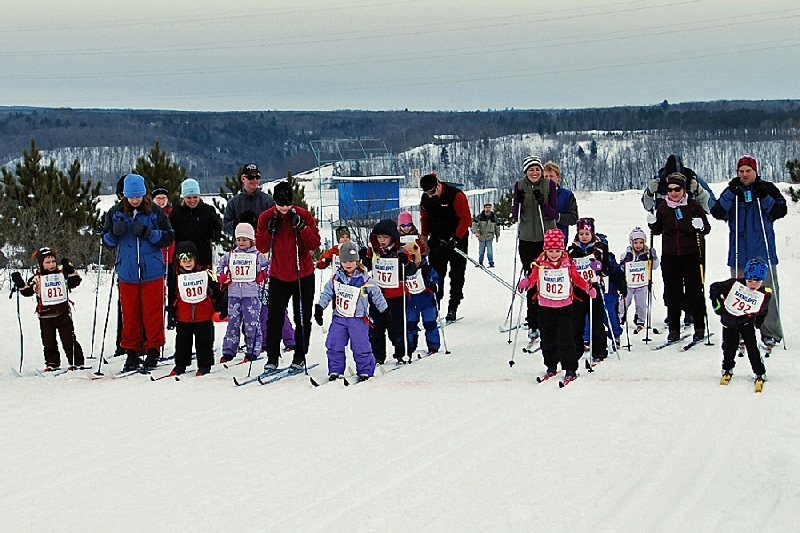 Here, the 2 km ( 0.9 miles ) race gets started. 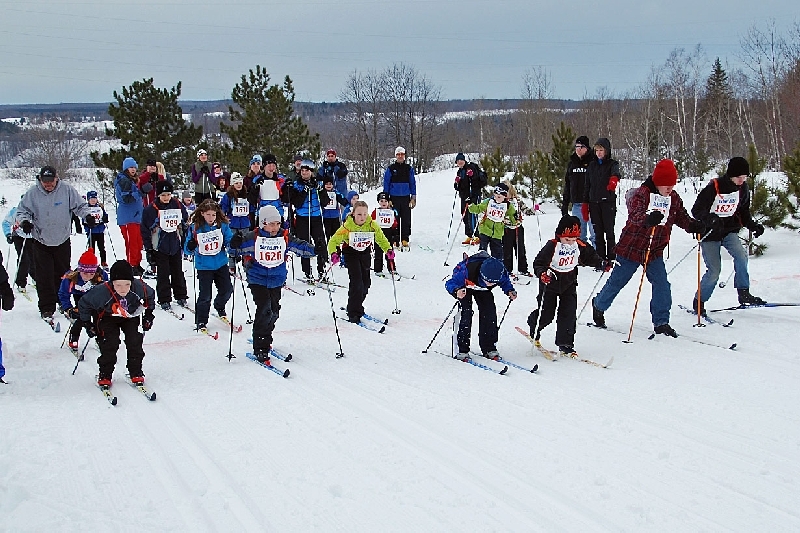 The races are a way of developing interest in cross country skiing by youngsters, and to acquaint beginning skiers with the Mastto Hiihto Ski Trails system. And the 1 km ( 0.45 miles) race is underway. 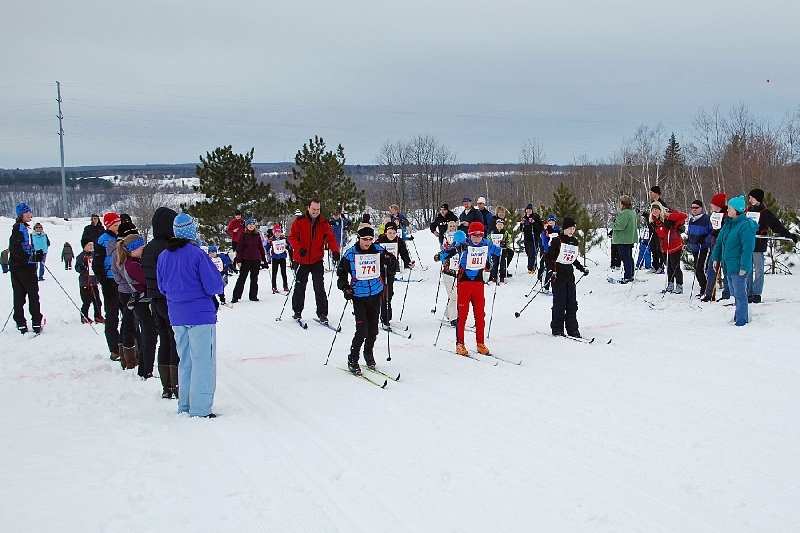 While there is no charge or fee for the races, a donation is accepted to help the Keweenaw Nordic Ski Club (KNSC) in their trail up-keeping expenses . The winner of the 4 km race crosses the Finish Line. Parents of youngsters competing with the Ski Tigers team, come out to help with the registration and other functions with the event. One of the 1 km group crosses the Finish Line. 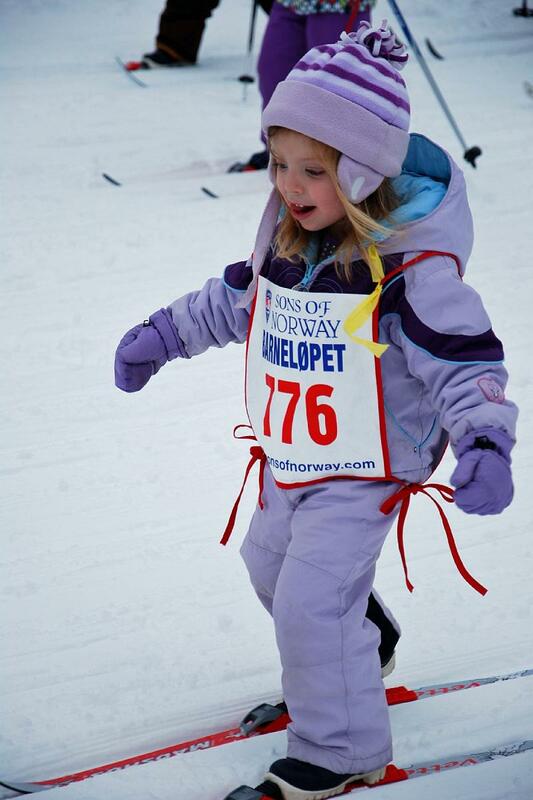 Skiers start at an early age, and do surprisingly well. Refreshments and hot chocolate were ready and waiting for all following the races. The weather this year was superb, with temperatures in the low 40s at race time. West Hancock had about 18 inches of snow depth this year for the event. Eileen Storhahl, wife of Sons of Norway, Ulseth Lodge 5-670 President Wayne Stordahl, holds up one of the medals given to each of the racers. See the Web links at the beginning for more info on each of the organizations.